I have received many inquiries regarding this buffalo sweater, and requests to share the pattern. Unfortunately, I am unable to do so. This sweater was a commissioned piece, and the pattern was supplied to me by the customer. After I had finished my knitting, I returned the sweater and the pattern to the owner. I did not retain a copy for myself (nor would it be right to do so). Once in a while I see a copy pop up on eBay ; this is where I suggest you look. There are four on the left front of the sweater. And four on the right. Eight more stomp across the back, including the biggest one right in the center. Four on each sleeve, of the smaller “accent buffalo” type. And each of the seven buttons is a molded buffalo nickel coin. Pattern: Mary Maxim buffalo cardigan, ©1957. A little kitsch, a little tobacco pipe, a little Mr. Rogers… but somehow gorgeous at the same time! Yarn: Cascade 220 in 8012 (oatmeal), 2403 (burgundy), and 2435 (rust). I don’t know the precise quantities used, unfortunately. Needles: Bryspun single-pointed needles, US 5. I wouldn’t ordinarily use straights for a sweater, but I was trying to match Cari’s mom’s knitting tension, and these gave me the right numbers! Gauge: after blocking, about 19.5 stitches and 28 rows per 4″. Row gauge was critical for the success of this project, since I needed the fronts of the sweater (knit by me) to match exactly to the back (knit by Cari’s mom). Otherwise the bands of buffalo around the bottom of the sweater and the yoke wouldn’t line up! (Our stitch gauge ended up being a bit different, actually, but I fudged a few stitches and no one’s the wiser ;)). Finished dimensions: approximately 34″ around the chest, 14″ from ampit to hem, and 23″ from shoulder to hem. Cari’s mom was a genius for choosing those nickel buttons, don’t you think? They tie the whole sweater together, and they are just darling! I used the one-row buttonhole from the Knitter’s Handbook (p. 196) worked over 3 stitches – it blends into the garter stitch button band very well. I was surprised that the shawl collar was knit separately and then seamed to the sweater body, but I followed the pattern without question and I think it came out exceptionally well. I know you will ask, so here’s a shot of the intarsia mess on the inside of the sweater. It’s not bad, I think. After blocking (in this instance, steaming), the ends matted down quite well. Last, I would like to thank three people. First, Cari’s mom for choosing this pattern, selecting wonderful colors and buttons, and getting me started. Second, Cari for passing the project to me when her mom couldn’t finish it – this is truly a once in a lifetime opportunity. I hope you enjoy wearing this collaboration – a little me, a little your mom, not too shabby overall (I’m hoping!). And last, my friend Susan – not only a gorgeous and willing sweater model, but an incorrigible camera ham. Oh my goodness, I love it so much. Who knew I would ever covet a buffalo intarsia sweater? And yet, I do! 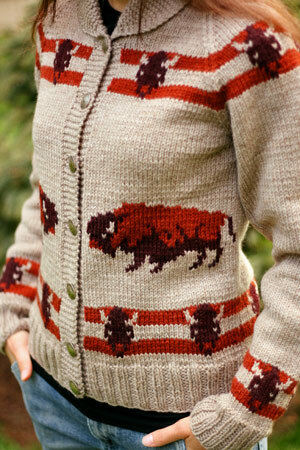 wow, i never thought that a sweater with intarsia buffaloes would be awesome, but this totally is! great work! I had forgotten about the buffalo sweater. I think it turned out great. The buttons are the perfect accent. Atta girl for finishing the project. 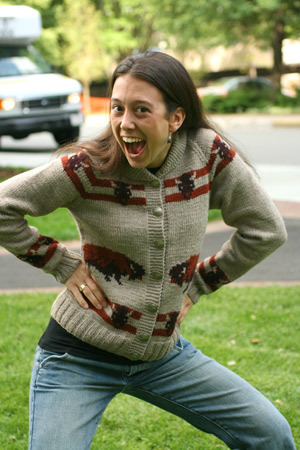 Your friend is awesome-I’m glad she’s enjoying the sweater, kitschy but awesome none-the-less. Beutiful knitting job. I have the Mallard Duck pattern for bulky yarn, wish it was more the cascade weight of yarn. You have completed a dream for your friend. Same here… without the pictures I would think, a sweater with buffaloes? how can that be attractive? but this sweater you’ve made is perfectly classy. I love it. That is kind of awesome, in its own way. I’m not sure why, but that sweater is just fabulous. Unbelievable. Good for you. I love this so very, very, very much. Years ago, my DH bought a sweater at some store in New York. It came with plain black buttons, and we took them off and put on some very cute buffalo nickel buttons. Yes, the exact same ones. They make his sweater great, and yours, too. I would so flaunt this sweater! Beautiful job! I wouldn’t have thought I would want this sweater, but after seeing how well it fits your friend, I kind of love it 🙂 Congrats to all involved. I never thought buffalos could look so, well, good. Kudos on a job well done! And I just love how this was a “pass around” knit. You could never tell. You did a great job. I like it and the fit is perfect. Love this sweater….wouldn’t ever think I would. I mean, buffalo on a sweater? But you just made it look so darn neat! Ho such a great sweater!! Love the colors! And buffalos! How wonderful that you resurrected a 50-year old pattern. I think it’s great and the buffalo buttons are divine. That is the coolest sweater I’ve ever seen! Made even more awesome by the fact that it was knit by two different people years apart. Beautiful! i have to say that i really hated the in progress photos of this one. couldn’t imagine why anyone would bother. but now i totally get it. that is a great sweater, and perfect color choices. I love it. I really doing. And I’m from Buffalo!!! I love it. I really do! And I’m from Buffalo!!! Surprisingly attractive; the buttons are fab. To whom is this going, now that it’s done? Congrats – impressive in every detail! It’s a stampede! Wonderful sweater. Cari is going to be so thrilled. I completely forgot about the buffalo sweater! I love it. Very nice work. That really is a cool sweater. I can’t believe how good it looks! That is an amazing sweater. I’m glad you actually finished it! I saw one of these sweaters “in the wild” a few weeks ago. I was visiting Winnipeg and while driving down the street, saw an older gentleman waiting at a crosswalk wearing this sweater, and thought immediately of your WIP. If his was indeed knit back when the pattern was created, that speaks to the longevity of handknits! I find myself really really wanting this sweater. Why is everything you make so classy – even when common sense says it shouldn’t be? You did a great job on that sweater. It is fabulous in its crazy buffalo way. love the sweater – and (as always) your writing. You make me laugh. I’m glad you put your friend’s face in; she looks like a good friend to have. Love the sweater! I would look like a buffalo myself in it (some folks are not built to wear that sweater) but I covet the buttons with a white-hot envy. Gorgeous! I was just thinking about this sweater and wondering if, because it was for someone else, we didn’t get to see pictures. I’m so glad that wasn’t the case. You did an amazing job on this. It’s so kitchy and cute. Congratulations. 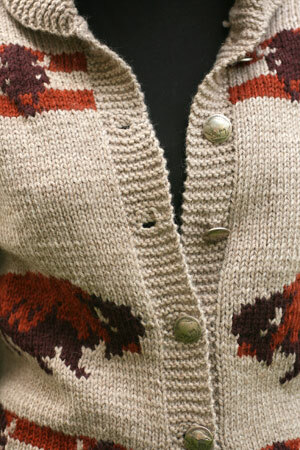 Normally, I wouldn’t call myself a buffalo-sweater-loving kind of gal, but this cardigan is great! Fabulous job! Aha! I wondered where that sweater had gone! On a non-buffalo related note, the first two pictures illustrate exactly what I always notice about raglan sleeves on a square-shouldered person… that extra fold of fabric on the sleeves. It happens to me every time. I’m knitting a raglan now and have been thinking about this issue a lot — I don’t see anything for it but to do short rows on the shoulder, almost the same way I would do it for the heel of a sock. 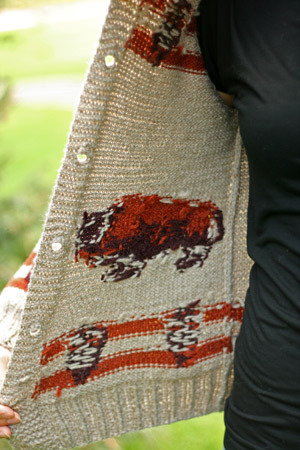 You rock the intarsia buffalo! Fabulous job. Wow, that’s a lot cooler than the 5lb boxy zip up jacket/sweater those Mary Maxim patterns used to make! I wish I could wear a 34″ chest…having buffalos climb over my mountains would certainly spoil the look, LOL. That’s an awesome looking sweater, very chic and well done! that is fantastic! my mom and i used to knit sweaters together. she’d get bored so i would do all of the stockinette etc. and she’d do the ribbing and the finishing or shaping. it was a win-win! Holy moo! That is truly one of the coolest sweaters I’ve seen in ages. Great work! Your friend Susan looks like she’s having a blast. It’s always great to see someone truly rocking the hand knit! While not something I would wear myself ( when you’re plus size the last thing you want is a giant buffalo sign on you’re back!!) I think it has a really fun 50’s look to it. Great knitting skiils. No one would ever guess it was knit by two different people. Wow! It looks fantastic! Being from Australia, I totally don’t get the buffalo thing. With every post, I was thinking “Buffalo? Why?”, but now that I see it finished, it’s wonderful!!! And I really really like the way the shawl collar sits. Good job! I agree totally about the buttons and seriously your friend makes that sweater look like such fun to wear! Oh my god that is so tacky and AWESOME at the same time!!! You rock the casbah! Awesome! And the buttons are perfect. You sure have been busy doing some gorgeous stuff, Kathy! Wow! I am over the moon for this sweater!!! I love this kind of vintage looking knit. And, well, the buffalo – I am a little biased. I once knit my own buffalo sweater! 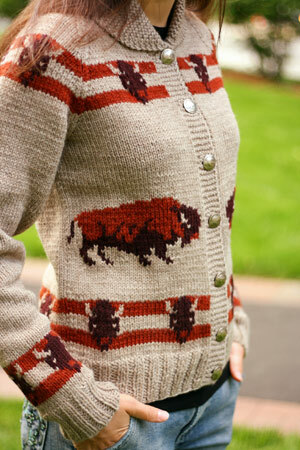 Never thought I’d have a thing for intarsia buffalo, but that’s a great sweater! This is going to sound weird, but I think your friend Susan went to UNH, or has a twin there, because I swear I have seen her on campus. And that sweater is gorgeous. 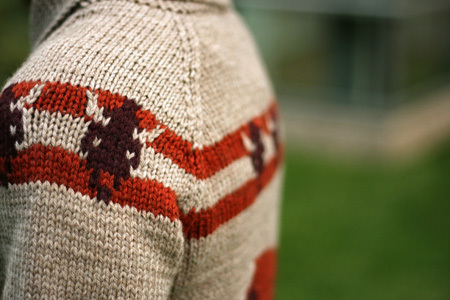 Really, I’m not an intarsia girl, but I want that sweater now. It’s awesome. holy mother of god. I love this sweater. and that many buffaloes? you’re my hero. And somehow I want to knit an intarsia Mary Maxim style sweater??? Well howdy there. I actually live right next door to Yellowstone National Park and Wyoming, where real live Buffalo DO roam. All I can say is, lovely, you captured them beautifully. Buffalo are notoriously cantankerous beasts so, good job! (also, plural of buffalo is buffalo, I know you knew that) Where did you ever find those buttons? They are not easy to find even out here in Montana! This is without a doubt the best sweater ever. It’s so beautiful, and the inside is the best anyone could hope for with intarsia. I want one!! That sweater – so cool! Fantastic photo shoot! “Somehow gorgeous” is the right expression. I admit to not feeling the love when I first saw it here, but the finished project is great! The fact that it fits so well is great step in making it more like a fashion statement, I think. I’m surprised how much I like this! I thought it might be a fun process knit (something different) but it turned out looking very stylish and wearable! At least by your very lovely skinnie minnie model; it might not look so good on someone my size, I guess. Definitely a one-of-a-kind sweater. You’ve done an amazing job on it. Freakin’ awesome. My husband was watching The Big Lebowski last night and this totally reminds me of The Dude’s sweater, but in a much sweeter, feminine way. Susan’s rocking it hard. Wow, between your knitting talents and Susan’s modeling skills, you make that buffalo sweater look H-O-T (and that’s no easy feat). That is one awesome sweater! I would have never even concidered knitting something like that, you know with buffalo roaming etc… but I have been shown again that one needs to keep an open mind so that one does not miss out on a lot of cool stuff. Beautiful, really! You did a fantastic job with this!! Quite a feat! 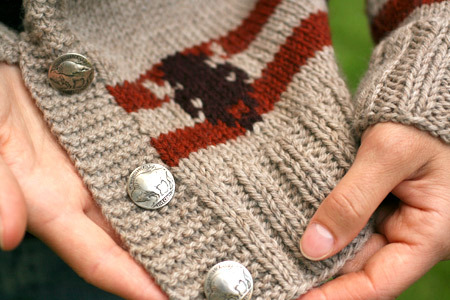 And I adore those buttons – this *almost* makes me want a buffalo sweater of my own. Probably won’t happen, but this is very, very cool. Like the others, it was good to see your “inside work” – really nice! Wow! That turned out fabulous! I love the button choice too! Great work. That sweater is so impressively kooky. You did an amazing job! What a fabulous sweater! The fact that it was knit by 2 people over a very long period of time boggles the mind. I must confess – when you first started this I thought it was dog ugly. Now I want it!!! It looks so incredibly cool on your “hammy” model!! She looks awesome! The buttons are a slam dunk. Great vision you have there, Grumperina. . . .
Man, that is one strangely awesome sweater. Congratulations on pushing through it! Super gorgeous! The choice of yarns I think is what makes it awesome in the wearable-clothing sense, and not the kitschy-thing-for-costume-parties sense. Hope your friend enjoys–she sure is lucky! Who knew a Maxim sweater could look so, so, stylish and hip? Must be the model, and the knitter. Nice. Real nice. Who knew? I love it! Except now I’m kind of itching to make a shawl-collared sweater with kitschy animals on it. wtf? That is one of the finest pieces of work I have ever seen……what a beautiful job! that is fantastic! 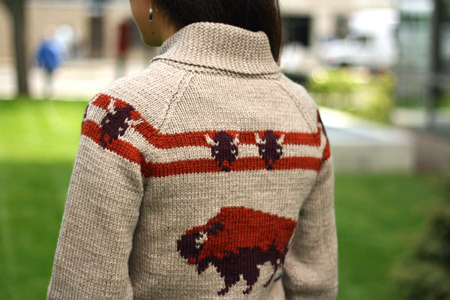 normally i would be a little meh on the idea of a buffalo sweater, but this is too good. now i want one too! Love love love this sweater. Love it so much that I found the pattern on ebay and can’t wait to reproduce this crazy thing. Wow! I have that same sweater, but mine was knit in 1957! 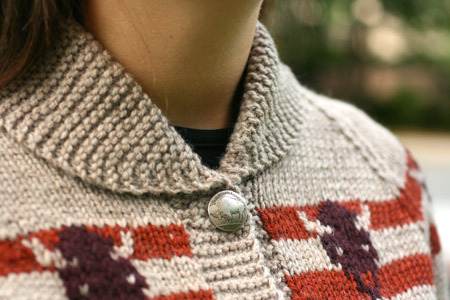 I love your buttons; mine has zipper and made with bulky wool. Go to my listing and it is pictured in projects and i have also posted at Vintage Mary Maxim group in projects. You look great in it!